Dayle Campbell Gaetz grew up in Victoria and attended the University of Victoria. She has always loved books, both reading and writing them. Her writing career began on Salt Spring Island where she wrote her first 16 novels. For several years she wrote a column for the local weekly newspaper and published the occasional article in children's magazines. 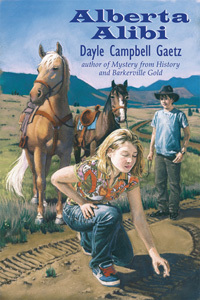 Dayle now lives in Campbell River, British Columbia where, in addition to her own writing, she teaches a correspondence course on Writing for Children and Teenagers. She has published 21 books for readers from ages seven to 17. She wrote two historical novels that take place in B.C. 's early days. On the heels of those books came Mystery from History and Barkerville Gold, both with historical connections. She had meant to end there, but the three young characters refused quit at Barkerville. They have since travelled on to Alberta, (Alberta Alibi) and recently into Saskatchewan (Something Suspicious in Saskatchewan). Dayle's other books from Orca include Sea Dog (Orca Echoes), the story of two lonely people, a seven year old boy and an old man who are brought together by their love of one dog. At the other end of childhood is No Problem (Orca Soundings), where a 17 year old boy stands on the brink of drug abuse. In between is an Orca Currents, Spoiled Rotten, about an outdoors-loving 14 year old girl who needs to deal with a new stepsister who really is spoiled rotten. For more information, visit www.daylegaetz.com. Sheila is in a race against time to save her father—and herself. Ghosts, buried treasure and dangerous villians—Rusty, Katie and Sheila are in their element.